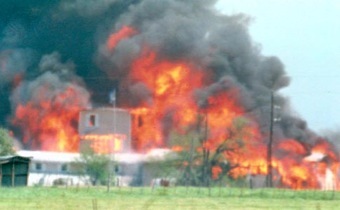 Note to readers: It’s been 20 Springs since a 51-day standoff between federal law enforcement officials and followers of Branch Davidian cult leader David Koresh ended in a shocking April 19th conflagration shown on live television. I chronicled the exhaustive local and national media coverage from beginning to end. The below two stories, originally published on March 11, 1993 and April 21, 1993, are divided by video of Fox4 reporter Richard Ray’s excellent look back at the tragedy in a recent piece tied to the 20th anniversary. WACO -- Sundance the swaybacked horse, gratefully nibbling on just about anything offered to him, seems at home on his range with TV satellite trucks, tents and RVs. The increasingly heavyset palomino is part of the feeding frenzy along a middle-of-nowhere road lined with modern-day tools of the TV trade. For $150 a day, Sundance's owner has been renting a corner of the horse's pasture to Dallas' KDFW-TV (Channel 4), KHOU-TV of Houston and the CBS network. Sundance has become a mascot -- and only an occasional irritant -- in an ongoing electronic stakeout two miles from the compound of Branch Davidian cult leader David Koresh and his followers. The horse occasionally has been known to nibble on the television cables snaking his turf. "We'll be the first station to lose a live shot because of a horse,” joked Channel 4 news director Mike Sechrist, who flew to Waco via helicopter Wednesday. "You want to let your people know you appreciate what they're doing,” said Sechrist, who had just returned from a food run into town. Law enforcement officials manning the entry-point to the media village took a liking to his white KDFW gimme cap. Sechrist said he promised to have a fresh supply flown in when the Channel 4 chopper arrived to pick him up later Wednesday. Tank-sized, techno-vehicles from Dallas-Fort Worth's three network affiliate stations have been joined by the likes of StarCam 5 from KOCO-TV in Oklahoma City, SpaceLink from KTRK-TV in Houston and Challenger 5 from KENS-TV in San Antonio. A bright, balmy, breezy Wednesday marked Day 11 of the standoff between the Davidians and an army of federal agents. "During the day it's just scratching for stories. The slightest little change becomes a big deal,” said veteran WFAA-TV (Channel 8) reporter Doug Fox. Wednesday's principal itch was Ron Engelman, host of a talk show on Dallas' KGBS radio (1190 AM). During his Tuesday program, Engelman asked the Davidians to display a white flag if they wanted legal and medical help. A white banner was displayed the same afternoon from a top-floor window of their compound. They later unfurled a printed message -- "God help us. We want the press” -- on a second white banner. Engelman's next step was a trip to the media village, where he arrived at midmorning Wednesday. He quickly was surrounded by reporters and cameras. "Are you concerned at all about being used by them (the Davidians)?” asked Channel 5 reporter Mike Androvett. No, said Engelman, who in turn accused the media of "not asking the right questions” of federal agents. Some reporters assigned to cover the standoff haven't been as conciliatory toward Engelman. KXAS-TV (Channel 5) producer David Magana, who has coordinated on-site coverage of the standoff since Day 1, said Engelman's involvement had done far more than "blur the lines' between news reporting and newsmaking. "This one has been dragged through the mud and the cow pasture,” he said. Magana has returned to Dallas once, to wash his clothes, since the standoff began Feb. 28. "It was chaos at first, complete chaos,” he said. Channel 5 and other TV crews since have settled into something of a routine. During the station's noon newscast Wednesday, Magana stayed in touch with Dallas by simultaneously listening through an earpiece and speaking through a mike. The cost of such coverage is imposing. Satellite time alone has a price tag of $8 a minute. "This is like a hole you're pouring money into,” said Channel 4's Sechrist. Some outfits are making a buck. Scott Lewis, a radio frequency engineer for Mississippi State University, drove the school's satellite truck 700 miles to Waco in order to sell time to interested parties. Clients, brokered through Satellite Management International of Dallas, have included A Current Affair and a station in Hamburg, Germany. Lewis also has been contributing to the local economy. Cab rides from the media village to his motel room cost $25. He also has invested in a T-shirt with a "God Sez Wait” inscription. One reporter -- Channel 4's Brett Shipp -- couldn't wait any longer Wednesday. He headed back to Dallas to join his pregnant wife, who is having a sonogram Thursday. "I'm beat,” Shipp said succinctly. Relieved that it's over, but shaken by how it ended, local television news operations are looking forward to life after the cult standoff in Waco. Coverage of the 51-day siege was a budget-bleeding combination of constant satellite feeds, around-the-clock overtime and incidentals such as campers, hotel rooms and state of the art, high-powered camera lenses. "I didn't add up the costs. I was afraid it would scare me too bad," KXAS-TV (Channel 5) news director David Overton said Tuesday. "Our company (LIN Broadcasting) just told us to do what we had to do." Overton and the news directors at KDFW-TV (Channel 4) and WFAA-TV (Channel 8) said the extra expense of covering the standoff would approach or exceed six figures at each station. Satellite time alone costs an average of $8 a minute, Overton said. Stations had to reserve blocs of time in advance and pay the full price whether or not all of it was used. "There's a wonderful sense of relief that it's finally over," Channel 4 news director Mike Sechrist said. "And then there's this horrible feeling about the way it got resolved. We sat here with open mouths when the fire started." 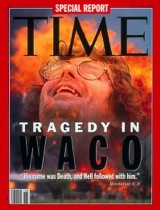 Live coverage of the Branch Davidian complex in flames was seen in about 725,000 homes in Dallas-Fort Worth between 12:15 and 1:30 p.m. Monday. Channel 8's coverage generally drew the highest ratings throughout the day, with Channels 4 and 5 usually running well behind. But Channel 5 had the first live TV reports of the assault on the compound by federal agents. Channel 5 reporter Mike Androvett, tipped that "something might happen' early Monday morning, decided to spend the night in the station's on-site RV instead of a motel. He went on the air "literally half-asleep,' initially worrying about being incoherent. Mr. Androvett, who covered the standoff full time with only a handful of days off since Feb. 28, said he "finally had a letdown" after Monday's 10 p.m. newscast. "I sat in my hotel room for a minute and tried to take inventory. Did we do everything we should have? What does it all mean?" Channel 8 news director John Miller said he was "surprised by how much it got to me, the emotions and sadness I felt" when the Davidian complex became an inferno. "News people are generally so immune to feelings," he said. "But this was different, because we lived with it so long. Some of our people probably made a dozen trips back and forth to Waco. It really became a part of our existence. I never met (FBI briefer) Bob Ricks. But I felt I knew him very well because I watched him every day." Throughout the standoff, Channel 5 was the only local TV station to carry the 10:30 a.m. briefings daily. It more than made up for a lapse that left the station without a satellite hookup to cover the first briefing on March 3. Channel 5 instead had to rely on a KRLD-AM radio audio feed while competing TV stations brought viewers live pictures. "If you're not always thinking ahead, the technology out there will kill ya,' Mr. Overton said. Channels 4, 5 and 8 plan to keep their satellite trucks in Waco until at least the end of the week. Channel 5's Androvett, who became a star reporter in the past two months, hopes to take some time off before returning to the station's Austin bureau. "For all the reporters out here, it's been a grind," he said. "As it begins to sink in, I think we'll be more and more horrified at what we saw Monday," Channel 8's Miller said. "Everybody's now busy trying to find somebody to blame. Society always does. To me, that obscures the point that this is a dangerous world and bad things happen." Meanwhile in Mounds, Okla., filming continues on NBC's In the Line of Duty: Assault in Waco, starring Timothy Daly of Wings as cult leader David Koresh. Scheduled to air May 23 on Channel 5, the made-for-TV movie will still end on the day shooting began between federal agents and the Branch Davidians. An epilogue will tell their fates.